I almost hate to admit it, but I kind of understand the temptation to put cowboy vampires (vampire cowboys?) in Buffy … at some point. 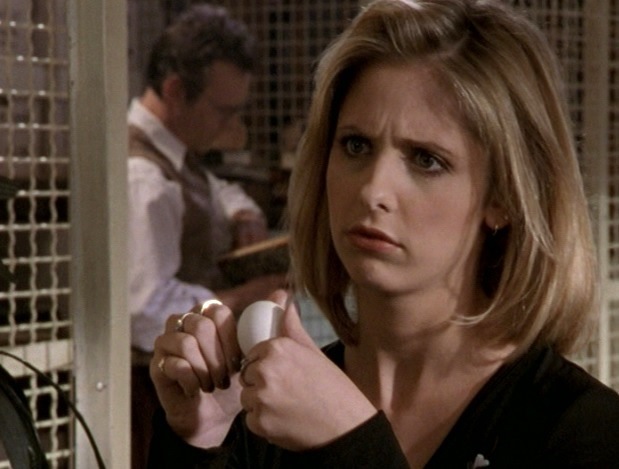 Maybe not in this episode, which is the Buffy equivalent of when you try to make pasta sauce out of whatever’s in your cupboard and while it might technically contain tomatoes, at least, and hold together in some way, that doesn’t mean it was a good idea. But if you were writing a show set in southern California you might at some point think about history, and then want to put something Olde in — not a serious part of history, nothing too real, but something of the Pop Cultural West, maybe — and it might occur to you that there were cowboys, right, at some point, and heck, maybe some of ‘em got turned! Why not. Let me answer that: BECAUSE THIS EPISODE, IS WHY NOT. On the other hand, I present to you: the mall. The mall at which Buffy and Joyce are shopping, as the episode opens; the mall that is somehow the Platonic ideal of Nineteen-Nineties American Mall As I Knew Them. The white tile. The food court. The lighting. The sad hallway to the bathrooms — why were they always so sad, those hallways? — that, in this case, also leads to the very, very dark arcade. The mall is so perfect you could use it as the foundation for a thesis about malls in ‘90s American television. This is not that thesis. Rewatch date: January 15, 2018 FOR STUPID REASONS that I would like to say are because I was a very busy woman with a social life but are more like “It’s January” “I’m a little depressed” and “I downloaded Animal Crossing and that was a foolish mistake.” I DID go see a band on the 12th, but it was an early show and thus I have no excuse, really.